These Stuffed Mushrooms make a wonderful light meal or an Appetizer. I just loved all of the fresh vegetables that were stuffed into the mushrooms! These mushrooms were so delicious, they were gone instantly. A shower of fresh basil adds a whisper of summer to a dish that’s already bursting with flavor. I also added goat cheese to the mixture for lots of flavor and topped off the mushrooms with some mozzarella cheese. To me this dish was like a carb free vegetarian pizza. Clean Portobello mushroom by removing the stem and clean the gills wiping mushroom tops. Meanwhile bring quinoa and vegetable broth/water to a boil in a saucepan. Cover and simmer for 15-20minutes or until all the broth is absorbed. Take off from the flame and cool to room temperature. While the quinoa is cooking, heat olive oil in a pan- add red onion sauté until translucent. Add bell peppers, tomatoes and sauté until peppers are cooked and heated through. Gently stir in the quinoa and turn off the flame-let it cool to room temperature. Take the cleaned mushroom brush some olive oil, season with salt and divide the filling equally into each mushroom cap. Sprinkle some cheese and bake for 10-12minutes or until warmed through and cheese is melted. Remove from oven place it on a serving plate, sprinkle with fresh sage, tomato and serve immediately. Stuffing can be personalised as per the taste. Brown rice/cous cous/white rice can also be used alternatively to quinoa. I am bringing this to Angie’s FF#52 an healthy appetizer for Anniversary Part1. Posted on January 22, 2015, in Appetizers, Breakfast, Indian, International, Main Course. Bookmark the permalink. 42 Comments. Chitra love the stuffed mushrooms, tonight I am making stuffed quinoa balls, I will be posting tomorrow, they are so good, I hope you will stop by to check out my recipe!! 🙂 Thank you!!! I look forward to your recipe Amy…. Thanks dear for your motivation and support…. Thanx a ton dear for all your encouragement and support…. am blessed…. yum!!!!! I’m always struggling to find new recipes with veggies… thanks for sharing! It is my pleasure and glad to know you like the veggie recipes…My blog is only veg recipes…Please advise if you are looking a dish in particular and give my effort to make and post them..
Wow! Home-made Pizza! You seem to be a great cook! Love this recipe, Chitra. 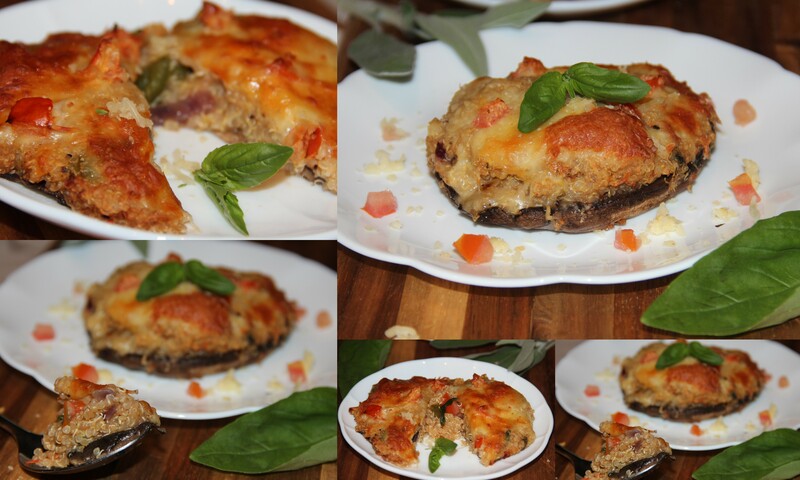 I could definitely make a meal of these stuffed mushrooms…delicious! I just love mushrooms, and love that you brought us a delicious appetizer that would definitely serve as a great lunch. Happy FF Chitra! These looks so yummy, Chitra! I love using mushrooms for pizzas too! Love this healthy take on pizza appetizers, yummy! This is such a great idea, using Portobello mushrooms! Looks delicious!